NBCUniversal Telemundo Enterprises today unveiled plans for the building of its new global headquarters in Miami-Dade County. The company is set to break ground on a 450,000 sq. 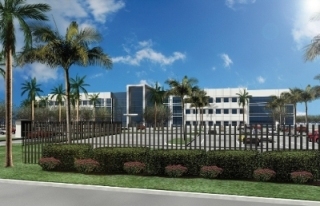 ft. "built to suit" facility on approximately 21 acres at NW 25th Street and the Florida Turnpike. NBCUniversal and parent company Comcast will invest more than $250 million in the construction of the division's new global headquarters which will initially house 1,100 employees, with the capacity to expand to approximately 1,300. The headquarters will bring all of the division's offices, broadcast and production operations under one roof including the Telemundo Network, Telemundo Studios and Telemundo International, as well as its cable network NBC UNIVERSO and its digital media operations. "This is a very important step in the evolution of our company at a time when we're enjoying tremendous momentum and have just wrapped a record-breaking year," said Cesar Conde, Chairman of NBCUniversal Telemundo Enterprises and NBCUniversal International Group. "Our new global headquarters will fold all of our division's offices and production studio spaces into one state-of-the-art facility that will help us do business in a more collaborative way. This significant investment clearly underscores once again NBCUniversal's and Comcast's long term commitment to our business and the U.S. Hispanic market." Governor Rick Scott said, "I am excited to announce that NBCUniversal Telemundo Enterprises has chosen Miami as the best location to build their new global headquarters and create 150 new Florida jobs. By cutting $1 billion in taxes and creating the new $250 million Florida Enterprise Fund this year, we will make Florida more competitive so companies like Telemundo will continue to grow and create jobs for our families." "Our investment in this technologically advanced building is the latest example of our enthusiasm for NBCUniversal Telemundo Enterprises, its bright future, and our strong commitment to Florida," said David L. Cohen, Senior Executive Vice President and Chief Diversity Officer, Comcast Corporation. "As the country's largest provider of Spanish-language programming, we are excited about the development of this new headquarters and the opportunities it will provide as we further build on our strong commitment to the Hispanic community nationwide." The new state-of-the-art facility will be designed to be energy efficient and fully optimized to provide operational flexibility. Equipped with the latest production technology, the new headquarters will be an advanced television production facility, second to none in South Florida. The building of the new headquarters will favorably impact the South Florida economy creating approximately 3,000 construction-related jobs and generate an estimated $400 million in sales for Florida businesses. The new headquarters will have prime Florida Turnpike visibility and offer direct access to the city's major thoroughfares.